A Thrilling, Unexpected Surprise in the Tallest Stairwell West of the Mississippi! 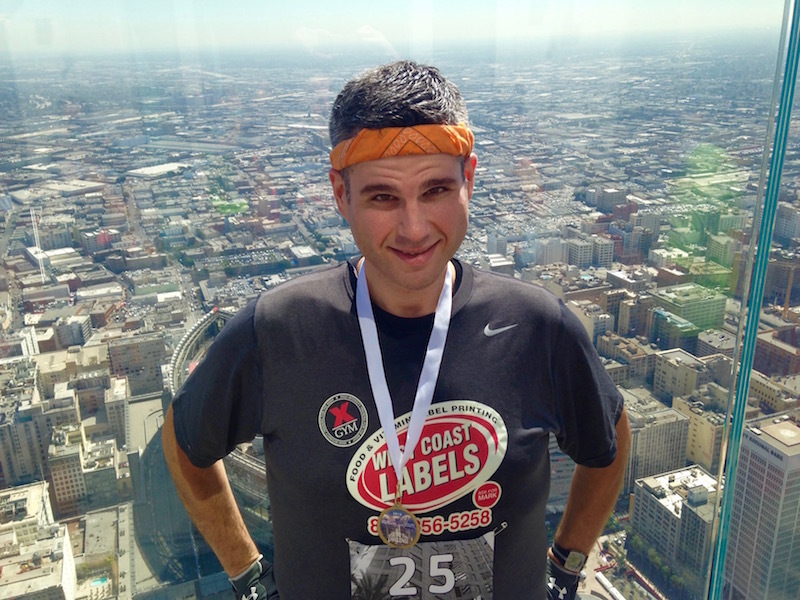 (2016 Stair Climb for Los Angeles Race Recap) | Keep It Up, David! 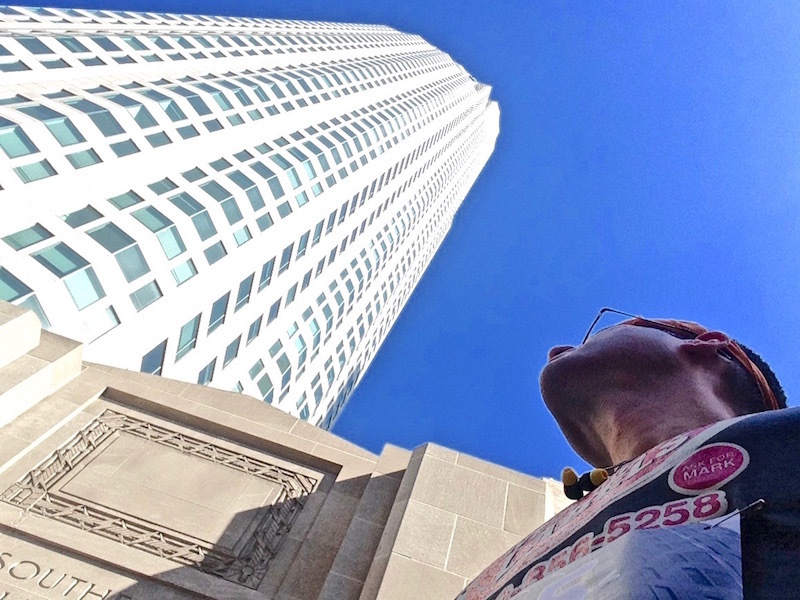 75 stories. 1,664 steps. 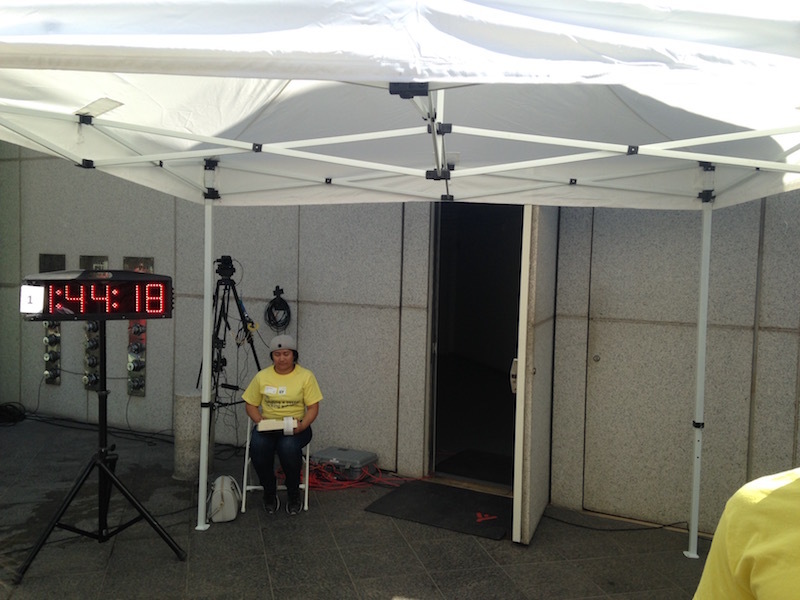 The finish line on the roof is 1,005 feet above the sidewalk. It doesn’t matter that I’ve done this race three times before – every time I show up for this event, I marvel at this skyscraper’s height. Buildings look taller when you know you’re going to be climbing all the stairs inside! 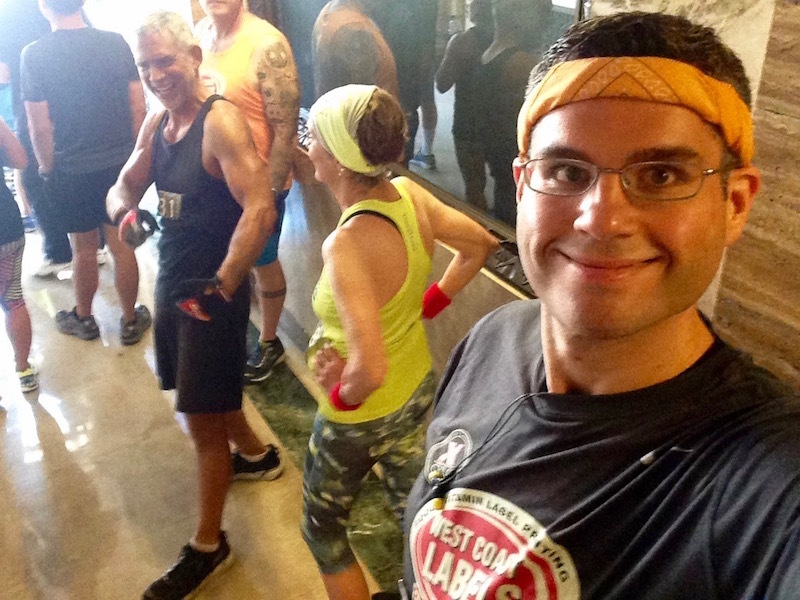 The race is called the Stair Climb for Los Angeles, and it’s a fundraiser put on by and benefiting the Downtown-Ketchum YMCA. They raised over $740,000 at this year’s race! As I’ve shared on this blog, I’ve been healing from a foot injury and it’s been the pits. I had to spend a couple weeks of the past month staying off my foot as much as possible, and so I arrived to the race on Friday feeling untrained and unprepared. But that’s OK, because I didn’t quite feel confident enough about my foot to give this race my all anyway. The last thing I wanted to do was aggravate the injury and go back to square one with the recovery process. I had already made peace with the idea that this race wasn’t going to be a race for me at all. It was going to be a fun outing, where I would climb the stairs slowly and smartly, eventually get to the top, and celebrate my participation. I wasn’t going to worry or stress about my time. Eliminating that pressure was incredibly freeing. I usually don’t sleep well the night before a big race, but I slept like a baby. I didn’t have to deal with the nerves I usually have up until I cross the start line. Not stressing about a race is so much easier than stressing about one! I had qualified for the Elite wave, which was populated with crazy fast climbers that came from all over the country (most of whom are friends), but because I would be doing the climb slowly, I positioned myself at the end of the pack. For this race, you line up in the lobby of the building next door, which is great, because it’s nice and cool, and it was a hot day. They were letting the Elite competitors enter the building one every twenty seconds, and soon it was my turn. There was nothing between be and the door to the stairwell. Even the official overseeing the start line noticed my nonchalance. “Look at this guy, he’s so ready he’s taking pictures!” I laughed. Once I got in the stairwell, I fought the urge to launch into race mode for about two stories, and then I settled in for a simple, leisurely climb. Since I wasn’t racing, I threw my technique out the window. I didn’t really use the handrails like I normally do, took too many steps on the landings, and while I double-stepped some of the time, I single-stepped an awful lot too. Even though I wasn’t focusing on my form, I did maintain a consistent pace, and I knew Margarita could very easily pass me. While I never turned on the gas, seeing Margarita on my tail, one floor below, provided enough motivation to not dilly-dally. So I kept climbing. My heart rate was elevated, and my quads started to ache as I got higher, but I never reached the very familiar point that I reach during these races where my legs feel like they’re going to fall off, and my heart and lungs are on the verge of exploding out of my chest. I crossed the finish line panting, but not depleted. I typically have to lie down immediately after crossing a finish line, but that wasn’t required this time around. 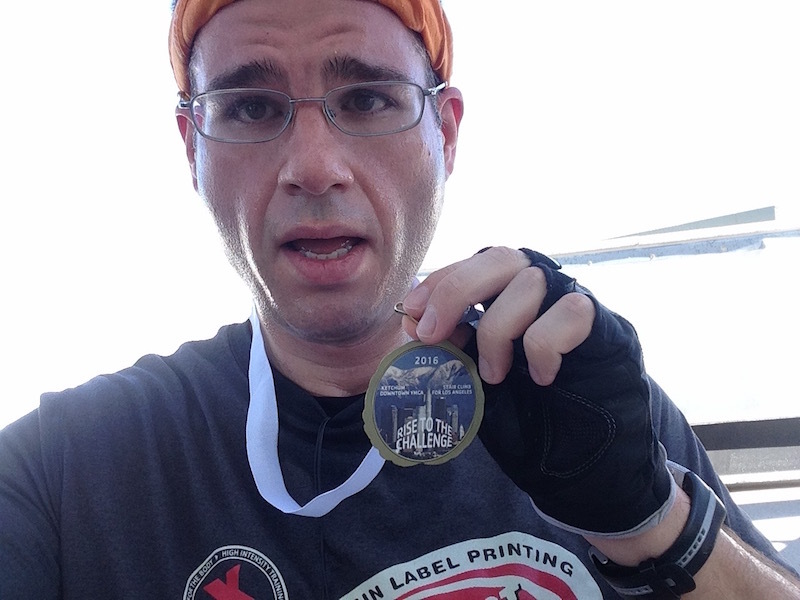 I stayed true to my word, climbed at a pace that wouldn’t endanger my foot, and earned my finisher’s medal. 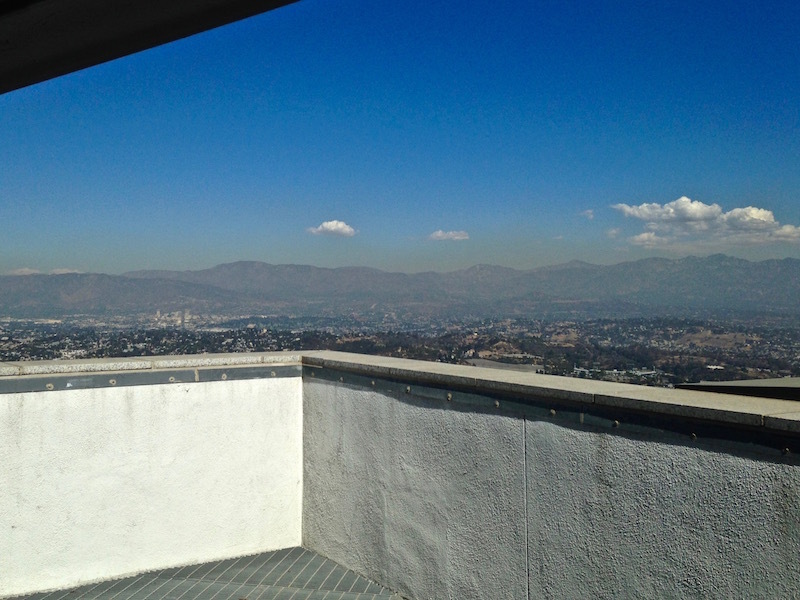 I also earned the views, with all of Los Angeles below me. Then I checked my watch. And this is when I had to sit down. I had just finished my fourth annual race in this building, and despite all my efforts to go slowly, I had clocked my second-fastest time ever. 19:36! I made it to the roof a solid minute faster than I did last year. It wasn’t a PR, because I was about a minute slower than I was two years ago, but this is an outcome I definitely wasn’t expecting. One of the reasons I love stair racing is because I have the opportunity to prove to myself, again and again, that I’m capable of doing astounding things, and this was one of those moments. This raced proved that I’m stronger than I thought. It showed that even though my training was severely interrupted a couple of times, I’m still in pretty damn good shape! Time to celebrate! Since last year’s race, a new observation deck called OUE Skyspace had opened in the US Bank Tower, on the 69th and 70th floors. This is where I met up with friends, rehydrated, and ate some fruit. There’s a great outdoor patio with amazing views of the city. There’s also a bizarre attraction called the Skyslide. 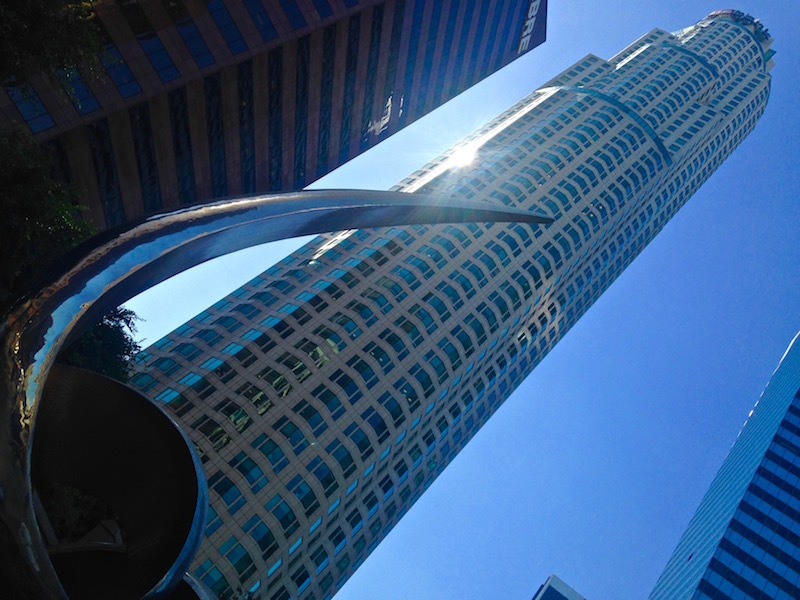 It’s a slide like the ones in schoolyards, except that it’s hung on the exterior of the building, 70 stories about the ground. 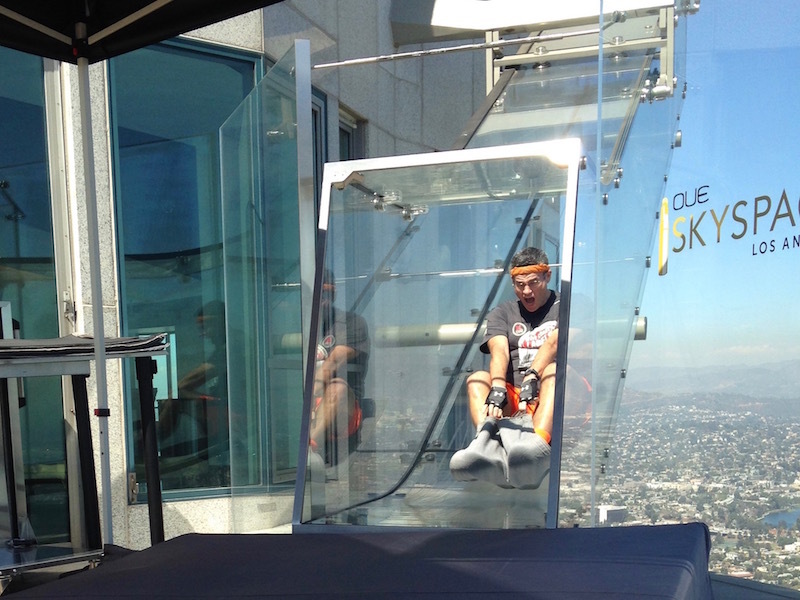 The entire thing is transparent, and while it’s a brief ride (about 5 seconds), it’s very fun, with only plexiglass separating you from the sidewalk nearly 1,000 feet below. I did it twice! There’s one more thing I want to share about this race – a ridiculously awesome honor that came my way – but you know what? I’m saving that for another post, which you can read here. Believe me, you don’t want to miss it! A huge thank you to Suzanne and Amy, who donated to the Downtown-Ketchum YMCA on my behalf, so that I could participate in this event. I love my sponsors! This entry was posted on Wednesday, October 5th, 2016 at 12:38 pm and is filed under Uncategorized. You can follow any responses to this entry through the RSS 2.0 feed. You can leave a response, or trackback from your own site.